Vertical bar charts are useful to illustrate sizes of data using different bar heights. A vertical grouped barplot often illustrates the sizes of multiple categories using different bar heights. For example, let's say we had a service that rented out scooters in San Francisco, California. Customers can make a one-time rental or pay a monthly subscription fee and get unlimited rides for under 30 minutes. So, for each ride, we log if the customer was a non-subscriber or subscriber. With these two categories for types of riders, we can see how they compare to one another with a multiple vertical bar chart. I'll illustrate a few examples below of when vertical grouped bar plots are useful. Set visualization styles to have all fonts scaled larger and figure sizes larger. Let's continue with the example mentioned above. 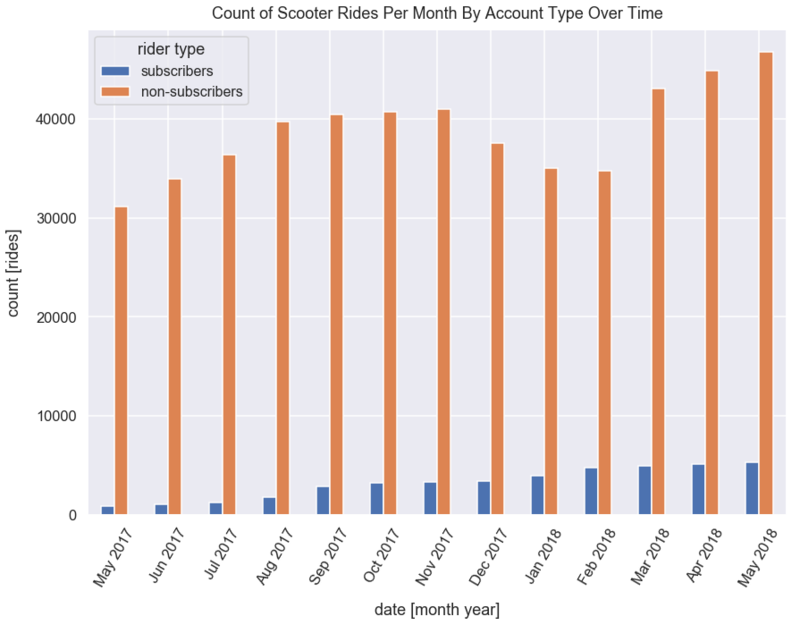 I'm curious about the trend of individual versus subscriber scooter rides over the past year. To get a high-level perspective, I think it would be helpful to look at the count of rides per month for each of these account types. The reason a vertical grouped barplot works well in this scenario is because we're most interested to see the change in count of rides by each type - rather than a change in total rides of the account types combined. So, with separate bars for individual and subscription accounts, we can easily visualize the trend over time. There is a clear trend that the amount of rides by subscribers has increased every month since May 2017. Also, the increase has been pretty significant as the count of subscriber rides per month has doubled from May 2017 to May 2018. However, non-subscriber scooter rides increased during the warmer months of 2017 from May to November. During the winter season, count of non-subscriber scooter rides decreased per month over several months. By March 2018, when the weather was much warmer, the count of non-subscriber rides per month drastically increased. 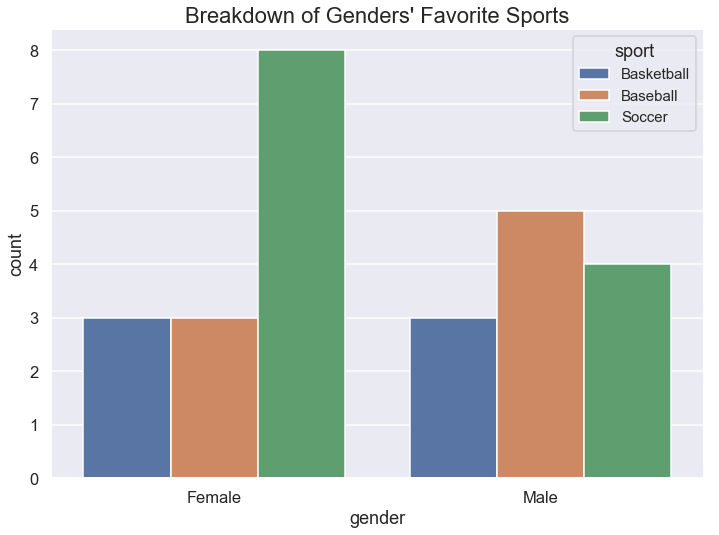 We want to visualize the data in two ways: 1) see favorite sports by gender and 2) see breakdown of a specific sport's interest by gender. 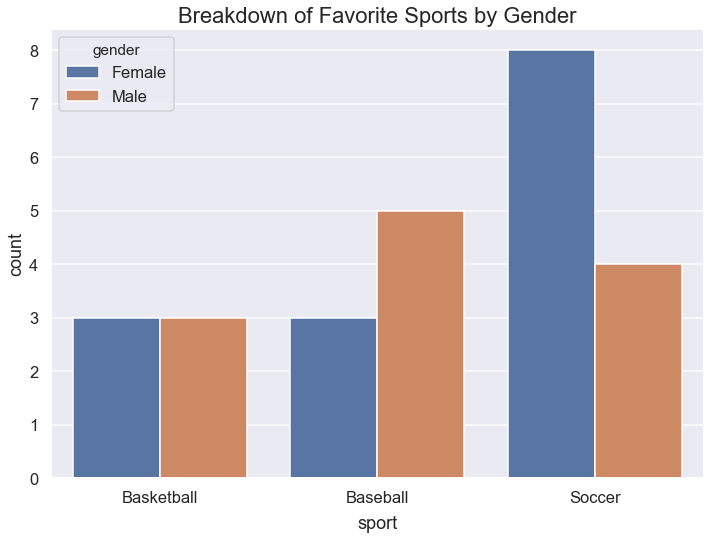 Our female friends majorly prefer soccer and our male friends nearly prefer all 3 sports equally.